What Are Slab Leaks, and Why Are They Dangerous? Slab leaks are one of the most menacing problems homeowners could ever face. A slab leak occurs when a copper pipe underneath a home’s foundation springs a leak. As you can imagine, having a concrete slab between the pipe and the plumber creates a troublesome situation. But the biggest problem with slab leaks is that it can take years for a homeowner to notice there is a disaster brewing underneath their house. Many homeowners have never even heard of slab leaks. This lack of knowledge can lead to a misunderstanding of the situation. If the homeowner takes a wrong guess at the cause of their wet carpet, the result can be disastrous. Unchecked slab leaks can destroy homes. Keep reading to learn the causes and best solutions for slab leaks. Many circumstances can cause slab leaks under your house. In short, something has to damage the pipes that run under the concrete. A reaction between the metal in the pipes and minerals in the surrounding soil causes some slab leaks. That chemical reaction can corrode the pipe and cause small holes to form. An earthquake will cause sudden and drastic damage to pipes, among many other parts of the home. Hot water pipes, in particular, tend to expand and contract as temperatures change. This constant swing in pipe size will cause the pipe to grind up against everything around it. Just as waves in the ocean grind rocks smooth, the continuous slow grinding of your copper pipes will wear down the affected areas. Pipes can get damaged during a house’s construction. Sometimes the guys pouring the concrete are not diligent people. They may have been rushing to get the job done. One of them could have just been careless in their job performance. All it takes is one moment of distraction, and the damage starts before your house was even built – and that could have been decades ago. How Do You Know You Have a Slab Leak? The most obvious sign of a slab leak is moisture-related problems with your flooring. Of course, we are talking about the lowest floor of your house. If you have an unfinished basement, you will see a wet spot on the concrete floor with no signs of a leak above it. If you have carpet on your lowest level, it could be squishy or have a musty odor. Wood or manufactured flooring above a slab leak may warp, flake apart, or give way underfoot. If the leak is bad, you might even hear water running under the concrete. Other signs of a slab leak include higher water bills and lower water pressure. If you suspect there’s a leak under your foundation, you should call a plumbing professional right away. Why Are Slab Leaks So Dangerous? Left on its own, a slab leak can cause massive destruction throughout the home. It starts with warped flooring or mildew-damaged carpet. After some time, the soil under the slab will resettle and cause cracks in the foundation. As the house settles and becomes crooked, windows can shatter and doors will no longer close right. As you can see, you must repair slab leaks to salvage the whole house. Believe it or not, ripping up the affected foundation should be your last course of action. There are less destructive options available for repairing slab leaks. One such option is epoxy restoration. This method involves drilling two small access holes to allow the technician to repair the affected pipe with epoxy. Another reliable repair method is replacing your old pipes with a whole new, more durable system. This is the best option when the home is older and many pipes are showing signs of damage. Replacing pipe systems often involves some concrete demolition. The good news is the new system should also come with a lifetime warranty. Who Does Slab Leak Repairs in the Phoenix Area? Slab leak repairs are a specialty niche that few plumbers are willing to do. But the pros at Sav-On Plumbing do not shy away from a good challenge. That’s why we are a go-to service provider for homeowners across the valley. They know we will do the hard jobs the other guys won’t touch. Sav-On’s plumbing professionals have spent decades fixing Phoenix’s toughest plumbing jobs. We have a strong reputation for outstanding customer service and technical expertise. Whatever plumbing problems you’re facing, Sav-On has your back. 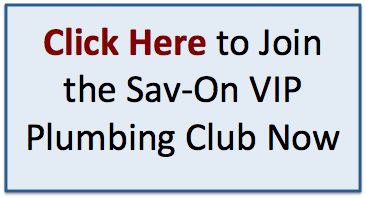 If you suspect there’s a slab leak under your home, contact Sav-On Plumbing. We will get a technician out to you as fast as possible, with the best water leak detection technology. Once we locate your slab leak, we will explain your best options for resolving this issue. Contact us today for prompt and thorough slab leak repair services.